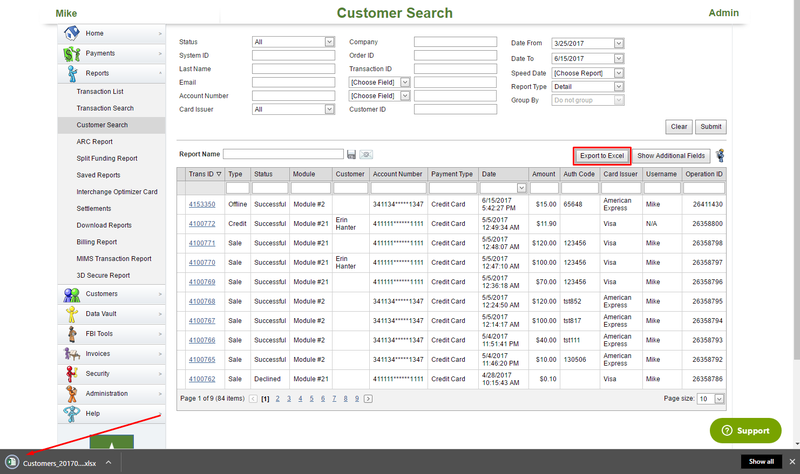 Customer Search allows the merchant to search for customer records from the transaction database. To access the search page use the Reports menu and choose Customer Search. Step 1: Select Customer Search from the Reports menu. 2. System ID – Identification number of the customer. 3. Last Name – The sir name of the customer. 4. Email – Email address of the customer. 5. Account Number – Enter the account number of the customer. 6. Card Issuer – Select the issuer of the credit card. 7. Company – Enter company name if applicable to the customer. 8. Order ID – Enter the identification number of the order. 10. [Choose Field] – The merchant may search any of the Custom Fields configured for the account by selecting a Custom Field and entering the appropriate data. 12. Date Range of the transaction. 14. Report Type: Specifies one of two report styles. d. Payment Type – the type of payment used for the transaction. e. Processor – the entity responsible for processing the transaction. f. Merchant Account – the account used to handle the transaction. g. Transaction Source – method that the transaction entered the system. i. Last Name – the last name of the customer. Step 2: After entering desired parameters click on Submit button. 2. Type - the operation used to create transaction (Sale, Refund, etc…). 4. Module – the type of module that was utilized for the processing of the transaction. 5. Customer – customer name. 6. Account Number – the number of the account of the certain transaction. 11. Card Issuer – the issuer of the credit card used for the transaction. 1. Sort - any column can be sorted in ascending or descending order by clicking its heading, to sort in the opposite direction, click the heading again. 2. Filter - column headings with a blank field below them will act as filters when you enter data. 3. Reorder - columns can be dragged and dropped anywhere left or right on the grid. 1. export of the report less than 10 000. 2. export of the report that exceed 10 000 but less than 300 000. 3. export of the report that exceed 300 000.